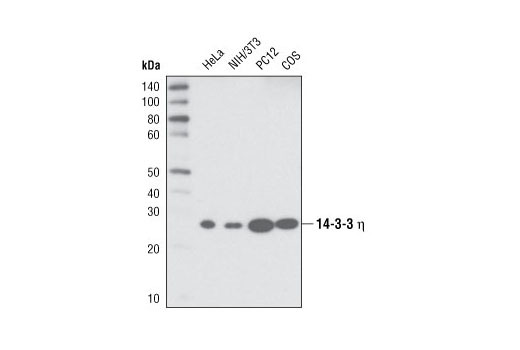 Western blot analysis of extracts from HeLa, NIH/3T3, PC12 and COS cells using 14-3-3 η Antibody. 14-3-3 η Antibody detects endogenous levels of total 14-3-3 η protein. This antibody shows weak cross-reactivity with 14-3-3 γ but does not detect any other 14-3-3 family isoforms. Polyclonal antibodies are produced by immunizing animals with a synthetic peptide corresponding to the sequence of human 14-3-3 η. Antibodies are purified by protein A and peptide affinity chromatography.